The Honor Play 8A has now finally been launched in China last week. The price at which, the device has been revealed in China brings it close to the RealMe U1. The comparison is based on specifications, features, and price. The Honor Play 8A is now officially been revealed in China last week. 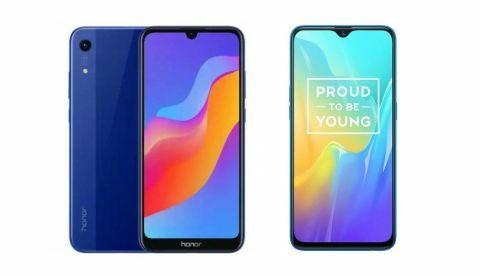 The phone comes with a water-drop notch on top of it and is powered by a MediaTek chipset, which is different from what we have seen in its successor the Honor 7A, that is backed by a Qualcomm Snapdragon 430 processor. On the other hand, we have the RealMe U1 that has a 25MP Al powered selfie camera and a tear-drop notch on top of the display. Let’s do a quick specifications comparison to know which phone is better when it comes to hardware? Let’s begin with comparing the display of these two smartphones in detail. Both the smartphones have a 6.3-inch display that has a water-drop notch on top of it. 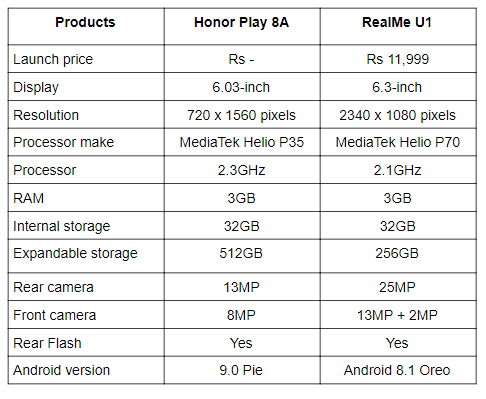 However, the RealMe U1 offers a better resolution of 2340 x 1080 pixels in compare to the Honor Play 8A that comes with a resolution of 720 x 1560 pixels. When it comes to the performance, the Honor Play 8A is powered by a MediaTek Helio P35 processor, which is clocked at 2.3GHz. The RealMe U1 is backed by the MediaTek Helio P70 processor, which is clocked at 2.1GHz. As far as the cameras are concerned, the Honor Play 8A has a 13MP unit on the back along with an 8MP sensor on the front, while the RealMe U1 has a 25MP AI-powered selfie camera that comes with features like portrait lighting, Bokeh effect and more. On the back, it has a dual 13MP + 2MP rear camera. The Honor Play 8A has officially been launched in China as its India release is not yet confirmed by the company. On the other hand, the RealMe U1 is available for Rs 11,999 on Amazon.